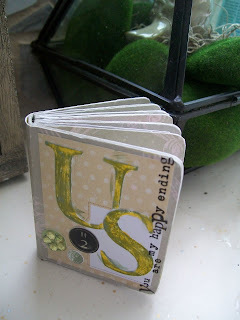 getting excited for my little scrapbooking girlie night planned for next week. we're making these cute little board books. (i'm filling this one with pics from d and my latest mini getaway) i've been wanting to make some little altered crafts ever since seeing them on multiple blogs and magazine entries. super cute. so i stocked up on little books, sent out the e-vites and am planning my beautiful candy buffet. sound fun? if you live close by, you can come too. just e-mail me. Love that you choose a book to put the "happy ending" title on. Those types of perfections make me happy! Super, super cool.